Dan Crenshaw Mocks Pete Davidson And Robert De Niro Returns As Mueller On 'SNL' Pete Davidson made fun of newly elected congressman Dan Crenshaw's eye patch last week. Crenshaw stopped by this week to say Davidson "looks like if the meth from Breaking Bad was a person." Saturday Night Live said goodbye to Jeff Sessions with Robert De Niro as Robert Mueller and Kate McKinnon as Sessions Saturday. Saturday Night Live packed in a couple of special appearances from unexpected guests, including Robert De Niro and Rep.-elect Dan Crenshaw. The show opened by bidding adieu to Jeff Sessions with Kate McKinnon reprising her role as the recently ousted attorney general. "I don't understand what I did wrong, you know," Sessions tells Vice President Pence (Beck Bennett) as he packs up his office supplies. "I put kids in cages. I said no to gays. What more did y'all want?" Donald Trump Jr. and Eric Trump (Mikey Day and Alex Moffat) stop by to make sure there are no hard feelings. Eric can't quite say "subpoenas." Sessions reminisces about all his time spent with President Trump, as a montage plays of appearances with McKinnon's Sessions and Alec Baldwin's President Trump. 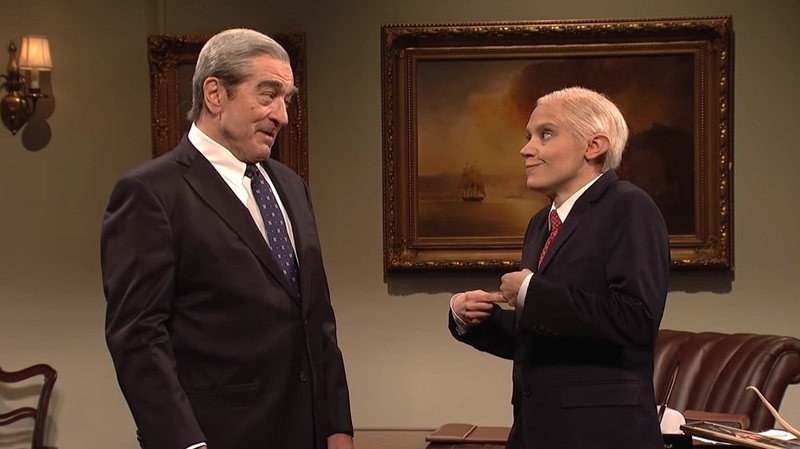 De Niro makes an appearance, back again as special counsel Robert Mueller. Reports this past week (not confirmed by NPR) say Mueller's team is writing its final report in the Russia probe. "Am I in the report?" asks Sessions. "A little bit," De Niro's Mueller responds. "OK, what about the president?" "A lotta bit," Mueller says. The night's host Liev Schreiber — best known to journalists for his portrayal of Marty Baron in Spotlight — offered a thanks to the "over 100 million people got off their butts and voted" in Tuesday's midterms. He wanted to dampen expectations a bit for the following show, however: "I am not someone who is generally considered to be a very funny person." A certain White House intern made the news this week after trying to take a microphone from CNN's Jim Acosta during a news conference. Cecily Strong tried to do something similar to "Weekend Update" co-anchor Colin Jost. Also on "Weekend Update," Pete Davidson apologized to Crenshaw, a former Navy SEAL who lost an eye while serving in Afghanistan. Crenshaw was elected to Congress as a Republican from Texas' 2nd Congressional District on Tuesday. Last week, Davidson brought on some criticism after making fun of Crenshaw's eye patch. Crenshaw appeared next to Davidson behind the desk to in turn make fun of Davidson's appearance: "He looks like if the meth from Breaking Bad was a person." And although not political news, SNL's sendup of a podcasting awards show featured a subtle nod toward NPR's Embedded. Blood Feud: The Cocaine Graveyards of Mexico lost out in the "Best Nervous White Girl In A Place She Doesn't Belong" category. Though, of course, the definitive and best NPR parody will forever be the 1990s-era Delicious Dish.